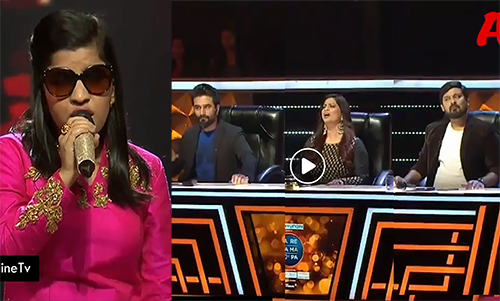 Menuka Poudel, the first contestant of Sa Re Ga Ma Pa 2018, a blind contestant from Nepal is left with tremendous praises from the judges and receives 100 per cent votes from the jury. Many jury members are left with tears in their eyes after her performance. She is chosen for the mega auditions. The second singer on stage, Sonu Gill, croons to the tunes of Shekhar Ravjiani's Ishq Sufiyaana. He also received 100 per cent from the jury and gets a go-ahead for the mega auditions by the judges. One of the teacher and student duo take centre stage but drive away all the judges in a comic gesture. Another contestant, Sushil Kumar, floors the jury and judges with his entertainment performances. He's not selected though for his voice doesn't make the cut. One of the contestants who graces the stage of Sa Re Ga Ma Pa, a shampoo vendor from Delhi, sings Tum Toh Thehere Pardesi. The jury and audience are thoroughly happy with his entertaining performance. In fact, the judges' trio even meets him on the stage. He gets a 93 per cent vote from the jury and gets a yay from all the three judges for the mega audition.